1988 ApHC Hall of Fame inductee Colida (1957-1982). "All stallions are not created equal," reads Colida's March 1976 Appaloosa News ad. An understatement for sure. Bill Cass, who bought the stallion in the 1960's, guided Colida to legend status during the stallion's 25-year life. The stallion was named Colida for Colorado and Idaho, his breeding state and his registration state. Colida was out of a Quarter Horse mare, Lady Chesty, by Chesty McCue (AQHA). Colida's sire, though known by his breeder, was never revealed to Cass. But Colida didn't need proof of his parentage to prove his worth to the Appaloosa breed. At his first show, in the fall of 1962, Colida won grand champion above two National champions. In 1963, Colida was named grand champion at the Appaloosa National Show in Boise, Idaho. Later that year, complications following surgery put Cass out of the saddle -- but not off Colida's back. Since his family and friends refused to saddle a horse for him, Cass taught Colida to sidle up to the porch so he could step on to ride. Quite a feat for a stallion that just a few years before had taken two men just to lead. While Colida had been bred to a few mares in Canada before he and Cass teamed up, the stallion's first U.S.-registered foal was stakes winner MS Miss Kitty, dam of Post Haste and Illinois race and halter champion. By 1966, Colida sons Flying Star and Porter C placed high in the 19th Nationals in Walla Walla, Washington, Flying Star won National Champion aged stallion and National champion stallion honors. Porter C placed fourth and Colida's Buck won first place in three-year-old geldings. Colida won the get of sire class. In the years that followed, Colida offspring made a name for themselves and their sire in both halter and performance. 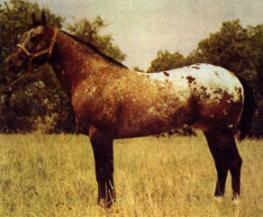 In 1974, Colida earned the Greater Eastern Appaloosa Regional (GEAR) title of Supreme Performance Sire No. 3, an honor won by having a minimum of five foals that have earned either a GEAR championship or certificate of versatility. Colida sired 570 registered foals. His get earned 22 ROMs and six of his offspring were bronze medallion winners. Colida was inducted into the ApHC Hall of Fame in 1988. Copyright © 1998 Appaloosa Horse Club. All rights reserved.